If you've ever seen TLC's " Extreme Couponing," you might conclude that coupons are for crazy people. You don't need a five-year supply of toilet paper, and you especially don't want to devote 40 hours a week to planning your grocery shopping. How about 15 minutes per shopping trip and $150 in savings? That's what Stephanie Nelson, publisher of couponmom.com, did this week, combining coupons, store sales and deals offered by her store's loyalty card. 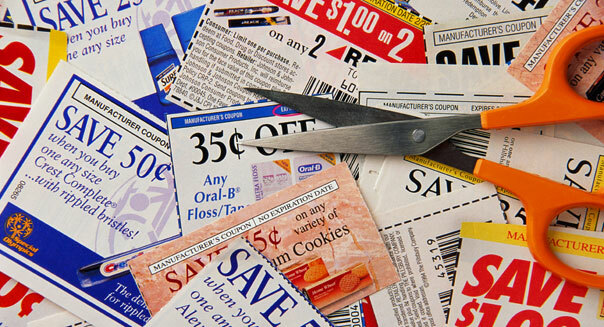 The proliferation of websites that match coupons with store sales has made saving money with coupons easier than ever. Those same sites offer video tutorials, links to store's coupon policies, On Sales and, most important, matchups of coupons to items on sale at most major store chains. That means even a lazy shopper can save money using coupons with minimal effort. "Let other people do the work for you because they already have," Nelson says. "A lot of people think they have to do it all themselves." You can find coupons in a variety of places. According to Nelson, 80 percent to 90 percent of grocery coupons still come in the Sunday newspaper. But you can also get coupons online, at matchup websites, coupon company websites and manufacturers' sites, as well as at some grocery store websites. Plus, some stores offer what is called a "Catalina" strip of coupons when you check out. ask your family and friends to save coupon inserts for you or drop by restaurants where people are likely to leave discarded newspapers and coupons. But don't turn down free money, says Laura Daily, a consumer savings expert and publisher of milehighonthecheap.com in Denver, who gives coupon workshops. "If I handed you a $5 bill, would you take it and crumple it up and throw it away?" she asks. But, she adds, "You don't have to be fanatical about it. ... You can [clip coupons] while you're watching TV." There are two parts to couponing successfully, Nelson says. One is clipping and finding coupons. The second is using your coupons strategically by matching them to store sales. For example, if Nature Valley granola bars are $3.95 a box and you have a coupon for 50 cents off, then you'll pay $3.45 a box. But if the bars are on sale for $1.99 a box, and you go to a store that doubles coupons, you'll get those same granola bars for 99 cents a box. The trick is to keep track of how often the items you buy go on sale and then stock up. If you have both a store coupon and a manufacturer's coupon for the same item, you can usually use both, increasing your savings. "The whole key to saving on groceries is to stock up on an item when it's at its lowest price, not when you need it," Nelson says. Both Nelson and Daily laugh at those who say coupons are only for unhealthy, processed foods. In fact, Nelson says, about 50 percent of coupons are for non-food products. This week's manufacturer coupon offerings include Fresh Express salad, Greek yogurt and oatmeal. "I'm a very healthy eater and we save a lot of money with coupons," Nelson says. And, as Daily notes, even Whole Foods offers coupons these days and accepts manufacturers' coupons. Both coupon experts use their skills to acquire items for charities, and some of their best scores are for toiletries and cleaning products. combining coupons with stores sales and clearance items -- another tool in a savvy couponer's arsensal. "If I can get a product for free or almost free, it's coming home with me," Daily says. There are myriad ways to organize coupons. Some people create a coupon binder. Others use envelopes and sort by category. Daily recommends the small coupon organizers you can find at dollar stores, with sections for each category. Nelson recommends filing your coupon inserts by date but not clipping until you check the store matchups and are ready to shop. Whatever you do, make sure you carry your coupons with you. While there are smartphone apps for coupon mavens, they don't yet go far enough that you can abandon paper. Savingstar.com has an app that lets you load coupons onto your store loyalty card. Favado, a new app, includes coupon matchups. While coupons can save you money, they won't always get you the best deal. For some people, no-frills stores such as Aldi and Save-A-Lot are a better choice, as long as you don't demand name-brand products. Sometimes a store brand item without a coupon is cheaper than a national brand with a coupon. Don't be blinded by coupon mania. "Just because you have a coupon doesn't necessarily mean it's a god deal," Daily says. "Quite often, generics beat out a good deal with a coupon." For a long time, Home Depot has been extremely great in carrying to clients the vastest determination of items as far as home change. This item retailer has been in the business since 1978 and is persistently developing through its other significant accomplishments, green systems and sponsorships. It was likewise in 2005 when the organization wandered into online home outfitting, which came about to home depot coupons and discounts on family unit things. Home change and outfitting these are the exact mantra of the business since 1978. In light of this thought, its online stores make it a focus to give their clients the best service and quality in family things. Clients will find their site easy to understand as items are legitimately ordered and named. Particular headings are additionally used to characterize the different items and determination of things. Cutlery with deals, cookware and utensils are considered some piece of the Kitchen Heading, subsequently permitting customers to specifically address their kitchen needs. Sheets, divider abstractions, trimmings and wallpapers, are likewise legitimately considered Home Furnishings. Space and association things are similarly incorporated as a component of the space frameworks record on top of wardrobes, shower and clothing. Apparatuses like radiators, vacuum cleaners and ventilation systems are likewise offered plus coolers and coolers. For client's lightning essentials, they in like manner have an exhibit of inside and outside lights. Shopping is generally simple if done on the web, since items are composed and fittingly distinguished. Home depot coupons are additionally set up for clients to make utilization of and apply. With these coupons as motivators, users can now get the greatly required things and profit of tremendous rebates. People can now buy work lights, furniture, barbecue sets and home adornments at a more sensible cost. With coupons being given through different connections and sites, purchasers can unquestionably spruce up their living territory or porch while never reconsidering. They likewise give customers a 10% markdown on chosen things. Representatives additionally have a decent amount of these benefits as the organization gives its specialists 20% rebate coupons throughout occasions and with Home Depot Deals and Discounts. Clients, who are a piece of the organization's mailing record, additionally accept coupons via mail. These coupons regularly represent to the extent that ten to twenty-five dollars off for each finished buy. An alternate incredible impetus for clients is the stamped things throughout blowout deals. There are likewise cases wherein leeway things are denoted numerous times that shoppers can essentially hold up for costs to reduction. At whatever point shoppers searching for coupons on-line users might regularly uncover oneself inside a situation where people have to reveal the most valuable coupons. When it descends to this everything hinges on upon what they will require and what could be looking for. This can eliminate people visits to the retailer and additionally eliminate the general expense. Various retailers in any case twofold or triple coupons on particular days. A few accumulates do this up to a certain dollar amount. It's in any case a fabulous system to amplify funds. Home Depot offers an extensive variety of items, for example, padding, kitchen machines, windows, inner parts, house ware, yard furniture and even the force instruments that are vital for home change. Various retail archives offering home change items have sprung up in the business sector and there is an intense rivalry around these ambitious people to enhance their deals. Therefore they are putting forth energizing arrangements on an extensive variety of their items to draw the clients shop at their stores. In any case, the clients may as well shop just at those stores offering brilliant items. Homedepot famous for offering amazing home items is putting forth predetermined number of home station coupons printable on constrained items to give it a chance to clients buy quality items at low cost. Home Depot offers exceptional coupons and offers for its clients who join the arrangement club and the star club. When joined the home stop improvers club then it won't just benefit those unique coupons yet can likewise own movie exercises showing home change tips. All these club parts can even appropriate message alarms about the later coupons, offers, promo codes and item discharges. For the comfort of its clients, homedepot offers a mixture of coupons. The printable home depot coupons could be found free of expense at the official site of homedepot. Users can even find home terminal coupons at different destinations. Here is a rundown of few homedepot coupons. When visitors wish to utilize the coupons make a point to enter the right promo code throughout checkout. Home station coupons printable might be found at authority home stop site free of expense. Saginaw County Parks and Recreation is teaming up with Apple Mountain to offer a discounted ski day. Participants can ski or snowboard at Apple Mountain on Saturday, Feb. 8 from 2 p.m. until close. Costs are $18 for a lift ticket, $24 for a lift ticket and ski rental and $38 for a lift ticket and snowboard rental. When tickets are purchased, request the Saginaw County Parks Promotional Codes and receive a complimentary lesson. Lessons are available from 2 p.m. until 4 p.m. for ages 8 and up. If you would like more information or have questions, please call Saginaw County Parks at (989) 790-5280. Copyright 2014 Midland Daily News - Midland, Michigan. All rights reserved. This material may not be published, broadcast, rewritten or redistributed.